This is one of my favorite body styles of Duesenberg. The Model J is one of the best cars ever built and a LeBaron Dual Cowl Phaeton is just such a grand way to tour. This is an early car (as evidenced by the engine number) and LeBaron was one of the three coachbuilders that Duesenberg invited to build bodies for their early cars. This style was designed by LeBaron co-founder Ralph Roberts. This car has its matching engine, chassis and body. Which is relatively rare. Sold new to the son of one of the Dodge brothers, the Gooding & Company catalog description says this is believed to be the only Duesenberg delivered new in Detroit. I guess Indiana and Detroit had a nice feud going back in the day (I’d say Detroit won the battle but Indiana is winning the war, economically speaking of course). The ownership chain is unbroken and known since. The car was restored in 2008 by Fran Roxas (that adds to the price tag significantly). This is one of the best designs of all time and can be yours for between $2,000,000-$2,300,000. Click here for more info and here for more from Gooding & Co. in Arizona. Update II: Sold, Gooding & Company Scottsdale 2016, $2,420,000. 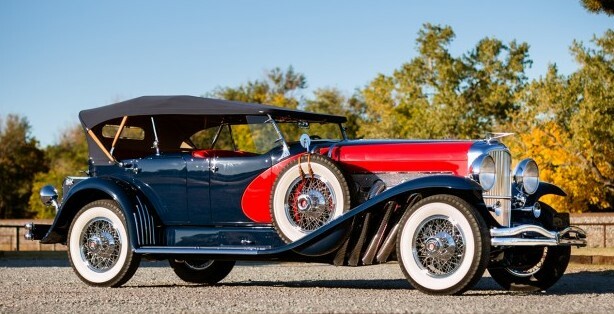 This entry was posted in Uncategorized and tagged 1929, auctions, cars, classic cars, dual cowl, dual cowl phaeton, duesenberg, gooding & co, j-129, lebaron, model J, phaeton by classiccarweekly. Bookmark the permalink.